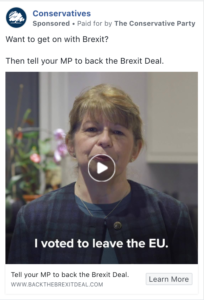 On 29th November, the Conservatives launched 152 ads about Brexit. They are promoting seven different videos, each with a slightly different angle on the proposed deal. 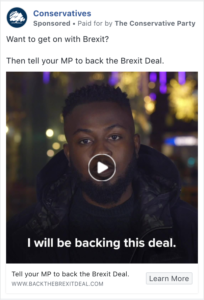 All have the same call to action – for people to visit https://www.backthebrexitdeal.com and email their MP, asking them to support the Prime Minister’s deal next week. On 30th November, they launched 7 more ads, meaning there are currently 159 running. We spotted them that morning. It’s worth noting that these aren’t the only ads you might see about Brexit. Other groups – notably Britain’s Future (who are running the exact opposite campaign), the Liberal Democrats, Momentum and Best for Britain and the UK Government itself – are all running campaigns. There are seven different ads (view them all here). Both Aine and Laura-Beth are Conservative activists, so their positioning as grassroots supporters of the Prime Minister’s Brexit deal may be seen as a little disingenuous (though they aren’t trying to hide their involvement in any way, outing their involvement by quoting and replying to one of our tweets last week). The others in the ads may have similar involvement in the party, we don’t know. Why are the ads running? You may have noticed there’s a Brexit on. Is the Conservative Party trying to lock down as many votes as possible ahead of the ‘meaningful vote’ next Tuesday? Definitely. If people email their MP and tell them to ‘get on with it’, it gives them cover to do something their ‘conscience’ might not have let them do a few days earlier. 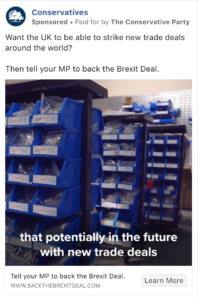 Are they trying to build support for the deal in the event of a second referendum? Possibly. 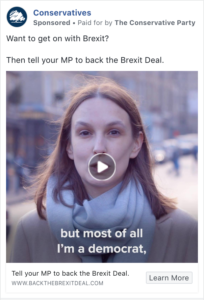 The campaign would certainly be an asset in any future referendum campaign, as you can target (or exclude) anyone who’s interacted with the ads or site (and are therefore more likely to be supportive of the ‘deal’ position). 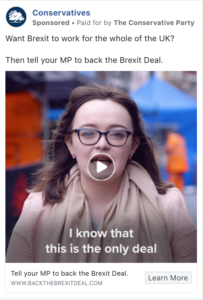 The ‘Back the Brexit Deal’ microsite includes the Facebook tracking pixel, which means anyone who visits it can become part of an audience for further targeted ads in the future. If that ends up as a few hundred thousand people, it could prove very useful next year. A couple of things stand out. First is that the campaign isn’t costing much. It’s less than £3,500 so far, even at the high end of the possible range. We used £5 as a benchmark CPM, or ‘cost per thousand’ impressions and this may even be on the high side (according to the transparency tools, the cheapest of the ads bought between 50-100,000 impressions for less than £100, which represents a CPM of £1-2). Second, is that, if you didn’t know already, a small amount of money buys quite big numbers when it comes to Facebook ad impressions (although they’re big numbers, it’s impossible to discern whether they’ve appeared to hundreds of thousands of people once, or fewer people many times. It’s a number for ‘impressions’, not ‘people reached’). Beyond that, a few users of Who Targets Me (if you haven’t yet installed it, please consider doing so) have shared the reason why they were targeted with the ad. Each time, it was because they’re “Over 18 and live in the UK”. So are the Conservatives really just spending a small amount of money, to reach people largely at random as long as they’re over 18 and live on this island? It seems unlikely, but we are only seeing the targeting for two of the 159 possible ads, and if we had more examples, that may give away more detail about the strategy behind the campaign. 135 of the 159 ads have seen fewer than 1,000 impressions and £100 spent on them. Perhaps these ones are more targeted (say at the constituencies of wavering MPs)? Perhaps they are tests to discover what the best performing combination of message, targeting and budget are? Unfortunately, without more data, it’s hard to say. We may have some other clues. Two Who Targets Me users who saw the ads also shared their constituency with the project – Lincoln and Sheffield Central respectively. Both are Labour seats and are held by Shadow Ministers. Both Lincoln (massively) and Sheffield (narrowly) voted in favour of Brexit. There’s no targeting to speak of. If you’re old enough to vote and you’re in the UK, you’re included. Based on our data so far, this seems most likely. 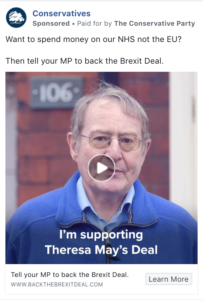 The Conservatives are trying to target Labour MPs (and maybe more senior ones) to pressure them to support the deal. They’re looking to target and pressure MPs in Brexit supporting seats, but who they think might be persuaded to support the deal. Potentially this could include their own MPs. 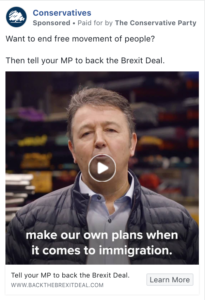 There’s lots more targeting that we’re just not seeing (and because Facebook doesn’t share this as part of their ad transparency tools, we have no other way of finding out, beyond asking the Conservatives directly, and they surely won’t answer). We don’t have the data to support any of the theories above with any certainty at this stage. We’ll keep looking, and update our analysis when the ads stop running, or just before the “meaningful vote” next Tuesday, whichever is sooner. To help us, please either install Who Targets Me, or screenshot “Why am I seeing this?” and send it to us if you’re targeted with any of the ads. This analysis is something of a test of Facebook’s new transparency tools in the UK. So far, they don’t perform very well for any nuanced reading of a campaign, probably because they’re not meant to. A tech tool that forces you to do lots of manual spreadsheet work, across 159 different ads, presents broad ranges of spending and impressions and gives away no information about targeting doesn’t seem like one that was designed for journalists and researchers to hold campaigns to account. It’s now over a year since Facebook announced it’d provide tools like this one, and for much of that time they’ve been at the centre of a great deal of controversy. You’d think that degree of pressure might have encouraged them to do better than this. Frustrating.